(5/8/13) A new version of Wings over Vietnam is available: Strike Fighters: Vietnam is only available from the developper website, I think. Contact information: Third Wire Software Click to see computer and game specifications for this game. 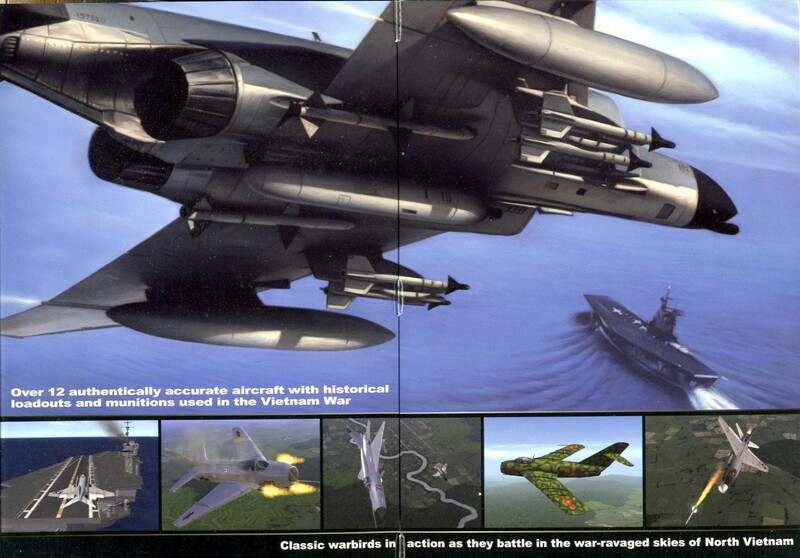 Strike Fighters: Vietnam is a development of the original Wings over Vietnam game. The basics are almost the same, meaning a "lite" simulation, still pretty realistic in the ways of plane handling and performances, weapons and so on, and with a big emphasis on modability (i.e. you can modify the game at your own will) and atmosphere. The graphics are nowhere near the later flight simulations games, but still very nice, and, as said before, what the game may lack in this aspect is widely compensated by the atmosphere itself, especially compared to the more recent but more "sanitized" simulators. 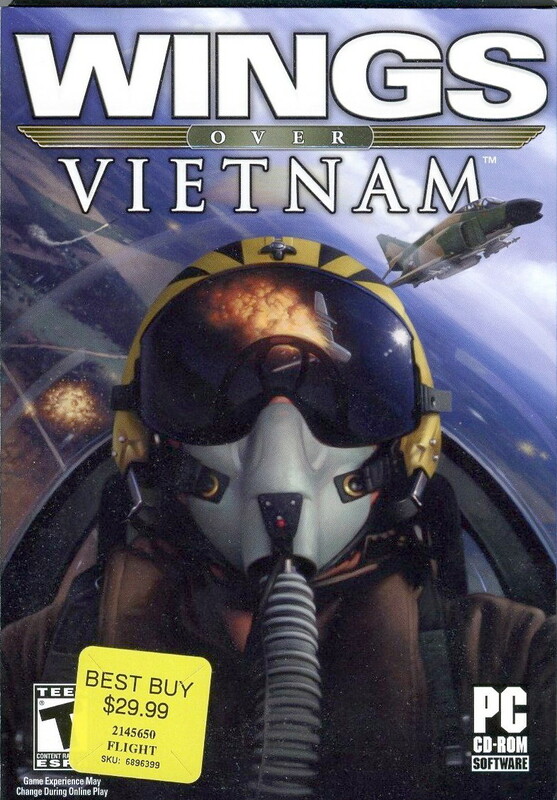 On top of it, the game is the only one depicting the Vietnam war. The basic game can be advantageously modified with free 3rd party add-ons. Most (if not all) of them are available at combatace.com . If you're interested, I can do a quick sum-up of the best of them to get a full Vietnam experience, including as an F-8 pilot. 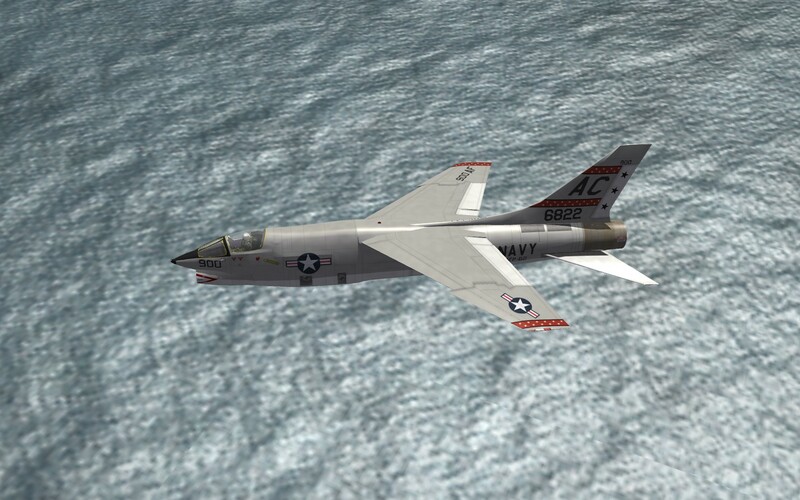 And RF-8s soon, as we're in process of releasing the RF-8A/RF-8G for this simulation. Basically, in the game, you have the 3D model of the plane itself, and wrapped around it, what we call the skin, i.e. the paint scheme. This way, you can paint the airplane with any scheme you want, and on top of that, you have "decals" for the numbers, modex, buno, unit number and so on. Kind of like making model kits, except that you can virtually fly them in the game once you're done! I've always been very attracted to military aviation, and the F-8 has become sort of a [passion] of mine, especially the recon variants. I think I always found the fact of going full speed at tree top level, armed only with a camera, as bad guys were trying to take a shot at you, pretty thrilling. To be honest, I'm really pleased to have this discussion with someone who actually worked close to these magnificient birds, and contributed actively to the achievement of their mission. Thank YOU for the superb website you're putting on for VFP-62. Basically, an official DLC is a payware add-on made by the game developers. You buy them on Thirdwire's webstore for Strike Fighters 2 series ( https://store.thirdwire.com/store_dlc.htm ), download the .exe file, and when clicked, it will install itself in your game. 99.9% of the community add-ons are free downloadable files made by the SF2 online community found at Combatace.com. The add-ons can be downloaded at Combatace's SF2 download section (http://combatace.com/files/category/388-strike-fighters-2-series-by-thirdwire/). Their installation may be a bit tricky for people not used to this game, and it would be a lenghty process to go through it in an email. Most of those add-ons come with a "readme" file, most often a .txt, .doc or .pdf, detailing how to instal them, and what other add-ons may be used to make them work (and, in such cases, where to find them). The particularity of this add-on is that it's using the 3D model of the only payware mod pack for Wings over Vietnam (the first generation of the game): Yankee Air Pirate. So you'll have to buy the 2nd set off mission (http://www.yankeeairpirate.net/SET2.html), and use the model they provide. This is a bit of a pain, but it is the only solution if you want to fly with an RF-8 right now. There's a new complete freeware add-on currently in development for RF-8A and G, but the release date is not known as for now. - For any questions, problems and so on, I highly recommend the Combatace forum. People there will be glad to help you if you are being polite ;-). Oh, and use the "search" function of the forum first, your question may already have been asked numerous times, and answered. All of this can look difficult, I know, but this game is a nice analogy of the F-8 Crusader: it's a demanding mistress, but once you've learn how to master it, it is one of the most rewarding and joyful virtual ride you'll ever have! I don't know if you are into these PC flight Sims, but this one is pretty good. The aircraft are modeled very accurately, the cockpits are also accurate and fully functional and the graphics are all around very good. It has the fighters and attack aircraft, with the exception of the AD, that were used by the Navy and Air Force during the conflict. The bad guys are throwing AAA, Sams and Migs at you all the time. I have been flying the Crusader most of the time, and found the game simulated the flight characteristics of that plane fairly well, at least from what the pilot reports I have read over the years say. Landing aboard a carrier is also rather exciting as well. The game no longer retails for $29.99. You can find it now days for around $19.00.